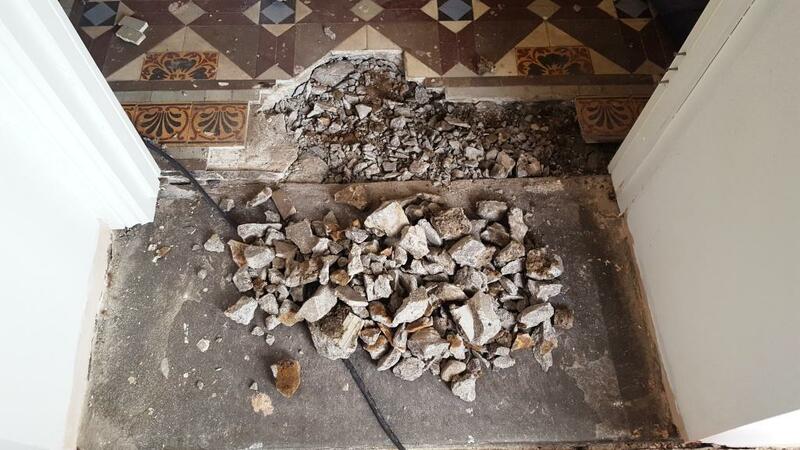 This Victorian tiled hallway floor, located in a property in Blackwood, South Wales, was in a bad way. It was suffering from several broken and missing tiles, and the entire floor looked like it had not experienced a good clean and fresh seal in several years. The property itself dated back to 1905, and it’s very likely that the Victorian tiles are original. However, the property owner was very hopeful that the hallway could be rejuvenated, so he contacted me to carry out the work. Upon my first inspection of the floor, I could immediately see that a lot of tile replacements would need to be carried out. I suggested to the customer that I repurpose the tiles that surrounded the matt well at the front of the door to use as replacements for the tiles that were broken and damaged. I would then create a new, larger matt well while using original tiles to fix the damaged areas. It’s a technique I’ve used before so I was confident it would work. He was happy with this suggestion so I agreed to return later that week to complete the restoration. My first task was to carefully remove the tiles around the exiting matt well, clean off the cement, and, in some cases, skim the thickness off some tiles so that they would position flat against the adjacent tile. Next, I proceeded to fix these replacement tiles in the areas required. After completing these repairs, I moved on to cleaning the entire hallway. First, I manually scraped off as much of the paint and cement deposits from the surface of the tiles as possible, before cleaning the floor thoroughly with a mixed solution of three products: Tile Doctor Pro Clean, Tile Doctor NanoTech HBU Remover, and Tile Doctor Remove and Go. Each of these products serves a different purpose. Pro Clean is reliable and powerful alkaline tile cleaner, while NanoTech HBU is a powerful cleaner which uses nano-sized particles to penetrate the pores of the tile and dissolve ingrained dirt and stains. Remove and Go strips away any old sealers, along with any of the stubborn paint and cement deposits. The solution was left to dwell on the floor for about half an hour, before I scrubbed it into the stone by hand using a coarse black scrubbing pad. The floor was then rinsed thoroughly, before Tile Doctor Grout Clean-Up was applied using a wire wool pad remove light grout smears (grout haze) and signs of efflorescence. I then completed the grouting of the floor left it to dry for half an hour before giving it a final wipe with a sponge. After leaving the floor to dry out overnight, I returned to the property the following morning. I ran some quick checks for moisture to see if the tiles were ready to be sealed. Thankfully, the floor proved dry and I could proceed the applying Tile Doctor Seal and Go. This sealer works really well on Victorian tiles and provides a nice subtle sheen finish whilst providing stain resistance. 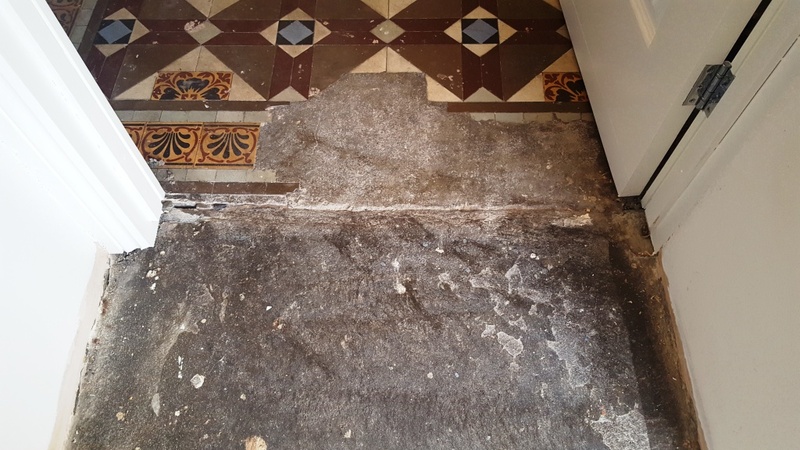 The customer had initially thought the floor could not be salvaged, but now he will be able to enjoy this fantastic original feature from years to come. It just goes to show that a bit of creativity and hard work really can make a difference. 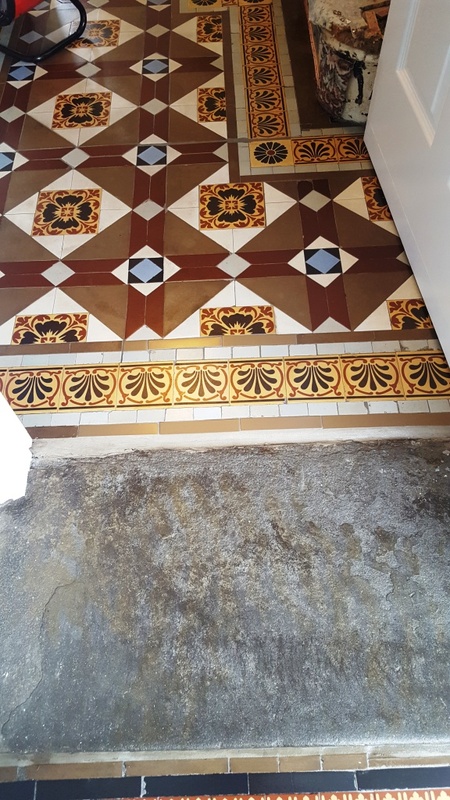 This entry was posted in Victorian Posts and tagged Blackwood, hallway, Old, Original, restoration, Tiled, victorian, Wales by AbzDominise. Bookmark the permalink. Julian Iacono is an agent of Tile Doctor, the largest Tile and Stone cleaning network in the UK who have developed the products and techniques to handle a multitude of issues surrounding tiled hallways including stone and grout.